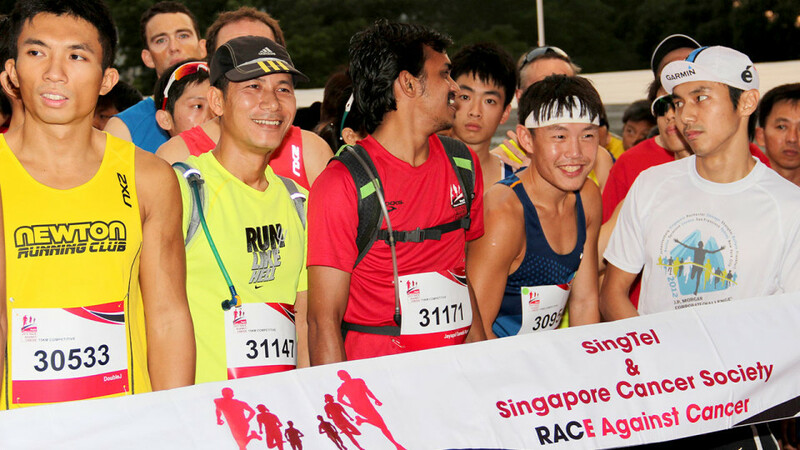 A record turnout of over 9000 participants gathered at East Coast Park on Sunday for the fifth annual SingTel & Singapore Cancer Society Race Against Cancer. 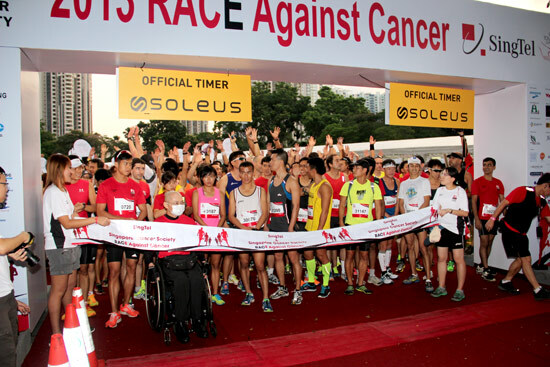 The race was organised by Singapore Cancer Society (SCS) and participants were running for a good cause. They were running for those who are unable to run, those who have lost their battle with cancer, rallying for those who are still courageously fighting against cancer and rejoicing for those who have overcome cancer. Keep fighting on and never give up! The lively MC got everyone psyched up into the mood before the race as well as the RAC wave. When an elite runner was asked to share his tips for the run, he said "Just have fun." Indeed, he was right. It was a fun and meaningful race with no pressure. There was a slight hold-up at the flag-off as the pedal cyclists went off first as part of the safety precautions. 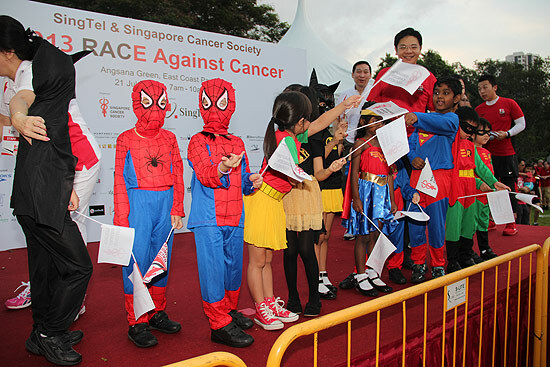 Acting Minister for Culture, Community and Youth Mr Lawrence Wong then flagged off the 15km runners at 7.30am, with the appearance of the cute league of mini super-heroes on stage. Everyone was clearly feeling upbeat about starting the race as the weather was cooling with the sun showing mercy as well. The flag-offs for the 10km and 5km categories went by after that without a hitch. 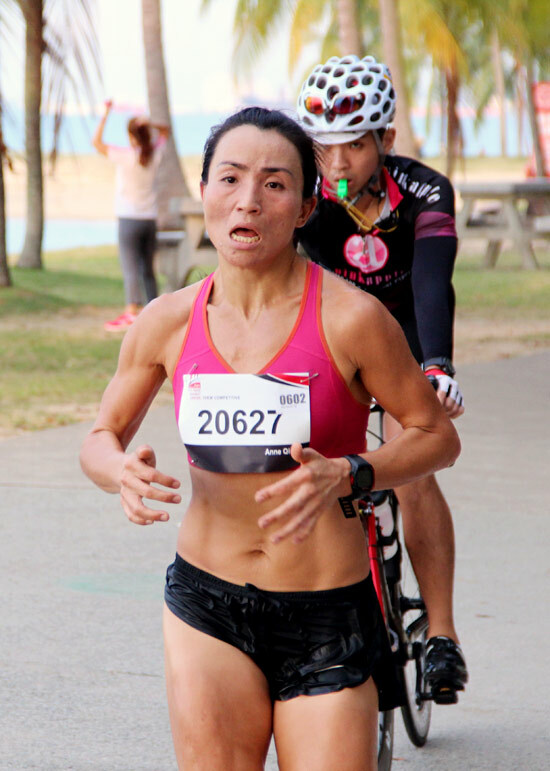 East Coast Park is a familiar route for many runners. Some runners might rejoice at the opportunity of a personal best while others may dread the u-turns and flat route. Perhaps a slight change or deviation of route to Changi Coastal could be considered? Nevertheless, runners were able to run at their usual pace as the route was smooth with minimal bottlenecks and no merging of lanes at all. "Please don't stop, I will be waiting for you", as indicated on the various bear motivation posters along the way to spur the runners on. These limited edition RACe bears were sold at $5 each at the race-pack collection with all proceeds going to SCS. Logistics were almost flawless with distance markers for every km and clear U-turn signs. The cold ice-water distributed by enthusiastic volunteers was a Godsend as well to quench the runners' thirst. After spotting the last poster that read "You're Almost Finished, Press on!" at the last 200m mark, runners crossed the red finishing line with pride. It was a smooth collection process for the medals, bananas and drinks. Runners were pleasantly surprised by the cold Yakult offered. The post-race event was like a carnival party with cheerleader performances, balloon arts and a themed mural, which were popular among runners for photo-taking. That's not all. The organizers were thoughtful enough to arrange for a Milo Van at the carpark area and really, who could pass up a cold cup of Milo with unlimited top-ups after the run? Qi Hui tops the women's 10km in 39min 16sec. Jagat Bahadur Magar and Mok Ying Rong took top honours for the men’s and women’s 15km category at times of 55min 58sec and 1hr 06min 13sec respectively. For 10km, Hillary Chir Chir and Qi Hui won in times of 32min 25sec and 39min 16sec respectively. The top 3 winners for the team challenge categories went to Mizuno, NTU Aquathlon and Team NUS. The only gripe about the race was the insufficient 15km medals at the end. However, the race organisers updated instantaneously on Facebook that the medals would be mailed to the finishing runners. RAC 2013 raised $750,000 for SCS’ programmes and services which include cancer treatment subsidies, welfare aid to needy cancer patients, home hospice care services for terminally-ill cancer patients and rehabilitative support programmes. Overall, it was a meaningful Sunday morning that sent thousands of participants leaving with a smile and looking forward to next year’s race. An energetic sports-bunny and avid shopaholic who loves her sports shoes and 5" high heels all the same. Picking up running 5 years ago was the best decision she has ever made and made her a stronger person physically and mentally. She believes in moderation in everything and it's mind over body all the time!